• Each Coin is Lavished in Ruthenium. • Walking Liberty on the coin obverse clad in 24KT ROSE Gold. • Eagle on the coin reverse clad in 24KT ROSE Gold. 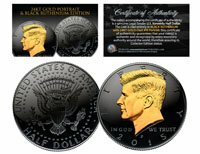 Here is your chance to own the BLACK RUTHENUM EDITION 2019 American Silver Eagle Dollar U.S. Coin. To highlight the original coin design, the Merrick Mint has clad the coin entirely in Black Ruthenium with Walking Liberty on the coin obverse and Eagle on the coin reverse clad in 24KT ROSE Gold. The American Silver Eagle Dollar coin is genuine legal tender struck by the U.S. Mint. It is minted in one full ounce of .999 PURE SILVER and measures a massive 40.6mm in diameter. Each coin comes in an acrylic coin holder and includes a Full Color 2-sided Certificate of Authenticity.